Signature from document signed March 24, 1633/34, co signed with his father Thomas. This is the Story of Simon Crosby (1609-1639) and his heroic journey. Can you image making the decision to leave 200 years of heritage, family, friends, and property to sail half away around the known world for an idea - an idea of religious freedom? And to take that risk with a young wife and an 8 week old son. How many of us would have made that decision? We can trace our family lineage in England back to the year 1440. Simon was the 6th generation from John Crosby, who was born in that year. The Crosby’s were generally land owners and resided in County York in the northern part of England. England during the 1600’s was undergoing a cultural revolution. Religious freedom was under attack by the crown kings of England. The Crosby’s most likely worshipped in the All Saints Church, which is still in existence. All Saints church stood on ground about 150 feet higher than the surrounding ground, and gave a grand view of the surrounding area. There were several fire brand preachers who advocated emigrating to America. Apparently, the Crosby’s became a part of that movement. Although Simon Crosby was the first Crosby to emigrate to America, the story is not complete without understanding that his father Thomas Crosby emigrated 3 years after his son. The wealth that allowed Simon to emigrate and secure his new home, was bestowed by his father. Simon Crosby and his young family had land and acreage purchased in what is now Cambridge, Massachusetts, at the current location of Brattle Square and Brattle Street intersection. They had a house and land already under cultivation by the previous owner, who was in the process of moving. Even though Simon only lived another 4 years, he quickly became a leader in his community. He and Anne had 3 sons – Thomas, Simon, Jr, and Joseph, from whom we have all descended. Anne remained single and raised her three sons, but in 1645 she married Rev. William Tompson and moved to Braintree, Massachusetts. 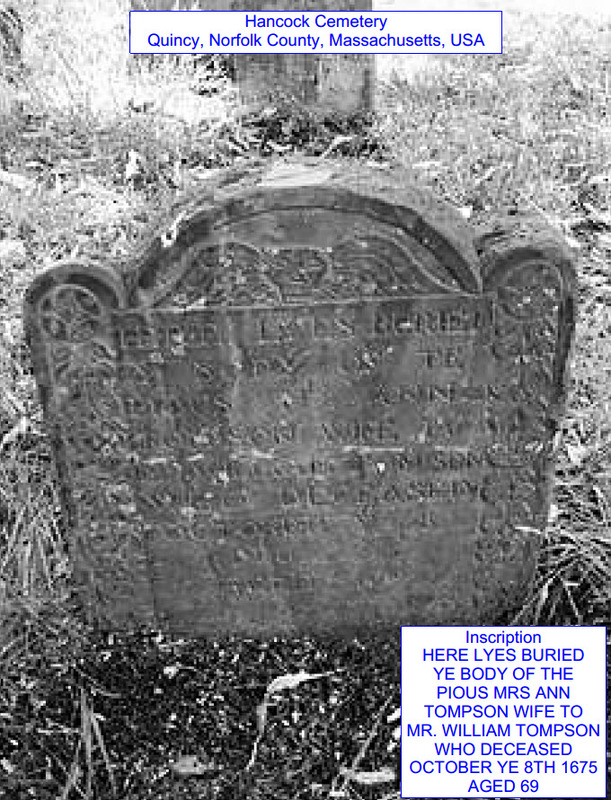 She died on October 8, 1675 and is buried at Hancock Cemetery in Quincy, Massachusetts. This is the history of Simon and Anne - and it is our also our history!